I do not think we have many artefacts in our collection, which can claim to have a whiff of royalty about them. The camel bag in the picture above is one of those few. It was given to Lieutenant Colonel Harold Richard Patrick Dickson by Sheikh Ahmad Al-Jaber Al-Sabah, the ruler of Kuwait (between 1921 and 1950) in the early 1920s. Born in Beirut, the son of the British Consul, Dickson spoke Arabic from an early age, and though he was educated in Britain, he spent most of his life in the Gulf, and had a great love for the people and ways of life of the deserts. In his book The Arab of the Desert (1949) he describes how he brought with him a traditional black Bedouin tent, which he gave to one of his friends, whose family lived a nomadic life in the desert. Whenever Dickson and his family could manage it, they would leave town and go live in his black tent. Thus, he managed to live a third of the year in the desert with the wandering Bedouins and their herds of sheep and camel. The traditional Bedouin life style has pretty much completely disappeared from the Arabian Peninsula today, leaving detailed descriptions like Dickson’s book as valuable insights into this way of life. He intimately describes the life of the Bedouins; from the rules of marriage and divorce, the furnishings of the tent and homestead, the religious beliefs and death practices, to the use of slaves and the tradition of camel raiding and warfare. But most of all, he manages to convey his own love of desert life, of the starlit nights, the cool mornings, the traditions and customs, and food. This book is dedicated with affection and respect to my friend His Highness Shaikh Sir Ahmad al-Jabir al-Sabah (…), distinguished ruler of Kuwait and staunch supporter of Great Britain in Arabia and the Gulf. Were it not for Shaikh Ahmad’s help and steady encouragement through seven and a half difficult years, I much doubt whether I should have ever had the courage to complete this book, a task I set myself as far back as the spring of 1929. So there you have it. A royal saddle bag, which brings with it the memory of the Arab desert, dust and the bellows of camels, and a lifestyle which is gone, but not forgotten. 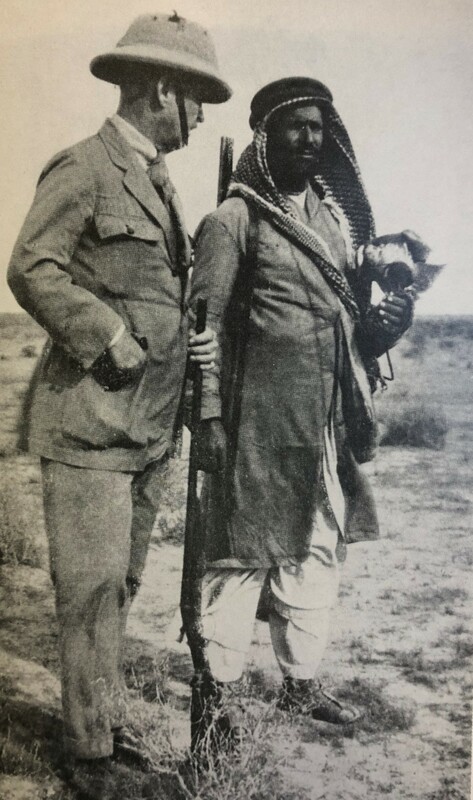 Dickson with Sa’ud ibn Nimran, chief falconer to the Sheikh of Kuwait (The Arab of the Desert, p. 85).